I tend to favor a rustic garden with not too much ornamentation. There was a time when I didn't want anything manmade in the yard. I can make up some really goofy rules for myself sometimes. Luckily I am mellowing out in my old age and decided to throw those rules out the window and get a little crazy by putting this big rustic bowl in the spot off the deck. 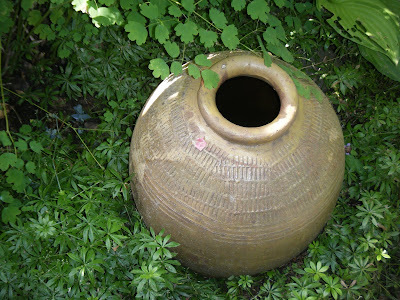 Of course, now I think it defines the whole space and I have gone through lots of ideas about what I could plant in that bowl......and then just today....I decided, "I think I'll leave it alone". I could see a whole grouping of these buddha statues(which are only about a foot tall) lined up in a modern yard - or at the base of a special tree, or sitting in a circle of gravel. And the creamy, white is a nice color pop in our yards which are so green in Oregon. And here's a tillandsia on a cedar board......this is a combination of two strong trends we see right now - the rage for succulents and tillandsias and the interest in vertical gardening. Vertical gardening is a great option for those with limited outdoor space. Imagine a whole wall filled with various and assorted tillandsias on boards. Just hose them down whenever you need to water. The cedar will go grey over time. This Quan Yin is so soulful. And the green glass float in the backgroundwould add a little soul to an outdoor space as well. 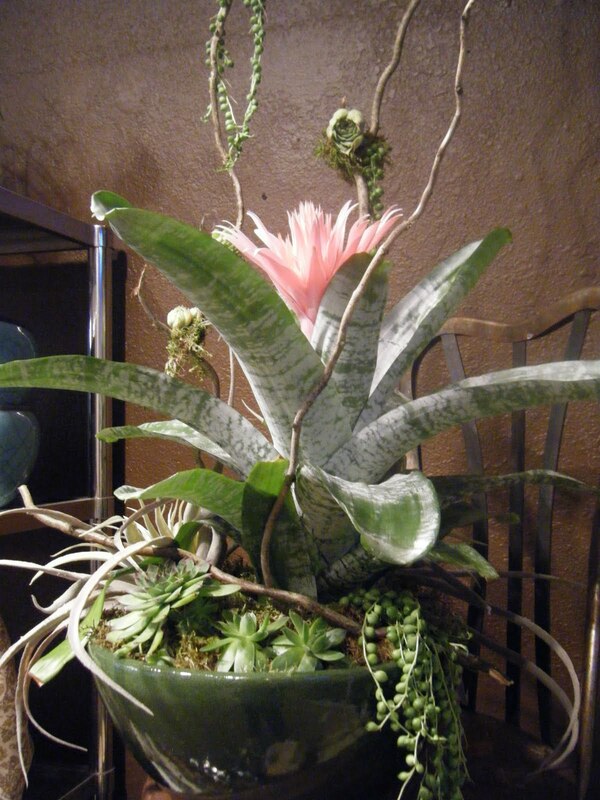 Also consider using bromeliads like the one above outside......opens up a lot of possibilities. These beauties would probably have to come inside during the winter....but you could enjoy them all summer. So there's lots more goodies at the store and not all Asian. Rustic pieces, birdbaths, lanterns, benches, aged moss pots and more all await their perfect home. Your make gardening almost seem posible on this rainy day! beautiful!